Bob Silverthorn, a spokesman for French Henry, confirmed to WKU Public Radio that she will file for the statewide office on Friday morning at 10:00 a.m. at the secretary of state's office in the Capitol. The Democrat filed a letter of intent on Jan. 22 with the Kentucky Registry of Election Finance to begin fundraising. French Henry won the Miss America title in 1999. She’s the wife of former Lt. Gov. Steve Henry and serves as deputy commissioner of the Kentucky Department of Veterans Affairs. Term limits prevent current Secretary of State Alison Lundergan Grimes from seeking re-election. So far, four candidates have officially filed to run for the office, including Democrat Jason Griffith of Whitesburg. The three Republicans include Michael Adams of Lyndon, Andrew English of Crestwood, and Carl Nett from Louisville. The deadline to appear on this year’s ballot is Tuesday. FRANKFORT—A group of state lawmakers are calling for the U.S. Department of Defense to abandon its plan to reduce personnel at military bases in Kentucky and across the country. The reductions would mean a loss of 16,000 positions at Ft. Campbell and 7,605 spots at Ft. Knox, as well a combined income loss of $1.29 billion in Kentucky, according to data from from the U.S. Army's 2020 Force Structure Realignment report, which was provided to the state committee by the Kentucky Commission on Military Affairs. The state's Interim Joint Committee on Veterans, Military Affairs and Public Safety wants intends to fight the reductions and voted Thursday to send a resolution to the U.S. Department of Defense. David Thompson, executive director of the Kentucky Commission on Military Affairs, said the $1.29 billion figure only includes income, thus the total economic effect of the base reductions could be much greater. "It's definitely fodder for a letter to the Army," Thompson said. "If we think they're going low on their estimates of economic impact, it's up to us to illuminate that to them and say 'hey, it's a much bigger impact than you're indicating.'" Kentucky’s Veterans Affairs Commissioner is stepping down to oversee the construction of the state’s new long-term care facility for veterans in Hardin County. Governor Steve Beshear announced Friday that Ken Lucas is leaving the post, and being replaced by Heather French Henry. Lucas is a former U.S. Congressman from Kentucky’s Fourth House District and a veteran of the U.S. Air Force and Air National Guard. Beshear appointed him head of the Kentucky Department of Veterans Affairs in 2009. He’ll now oversee the construction of what will be the state’s fourth veterans nursing home. The Radcliff Veterans Center is scheduled to open in September of 2015, and will provide 120 beds to veterans in the Hardin County region. Featuring a dozen ten-person homes, the facility will sit on 195 acres of land donated by the U.S. Department of Defense. Taking over as head of the Veterans Affairs Department on July 1 will be Heather French Henry. She began the Heather French Foundation for Veterans in 1999, shortly after she was crowned Miss America. If Grimes run, she's likely to get enough support to clear out the field. Otherwise, the Democrats have potential candidates known within political circles, but who may be not instantly recognizable with the majority of voters—former state Democratic Party Chairman Bill Gorman or environmental activist Tom FitzGerald, for example. Without Grimes, Democrats may find themselves with a crowded primary—and that would cause problems in a bid to unseat McConnell, who polls suggest is vulnerable, says Dewey Clayton, a political scientist for the University of Louisville. 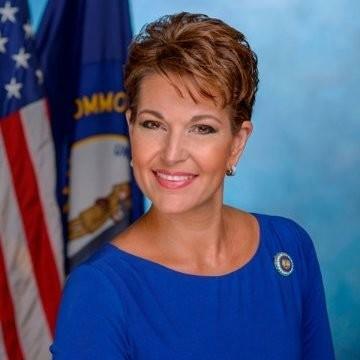 Former Miss America Heather French Henry is the latest Democrat to consider a challenge to U.S. Senate Republican Leader Mitch McConnell next year. French Henry, a Louisville clothing designer, said Wednesday that she's being encouraged to run, but that she has made no decision. McConnell is seeking a sixth term in Washington in 2014. Secretary of State Alison Lundergan Grimes is asking lawmakers to pass legislation next year to ensure that Kentucky soldiers deployed overseas are able to cast ballots. One of the measures Grimes proposed during a Capitol press conference on Wednesday would allow soldiers to return absentee ballots via email, lifting a requirement that ballots be send back via the U.S. Postal Service. Democratic Attorney General Andy Beshear's office issued an opinion last week saying posting a list of certified write-in candidates at polling places would not violate the state's electioneering ban. If implemented, the rule would benefit at least six current or former teachers who are running write-in campaigns for the state legislature. The Kentucky Personnel Board has voted to investigate Secretary of State Alison Lundergan Grimes’ use of the state’s voter registration database. Kentucky State Board of Elections Executive Director Jared Dearing asked the board to investigate. He said Grimes and her office have been using the database to look up the political party affiliation of current and potential employees. Grimes, as Secretary of State, is chairwoman of the State Board of Elections.